An I.T. closet or wiring closet is a small room found in commercial buildings for all electrical connections. The common purpose of the wiring closet is for computer network system, also known as Premises Wire Distribution (PWD) Room, and many other purposes. 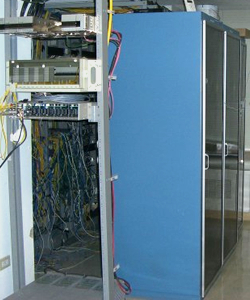 The network wiring room is typically similar whether for a small, mid-size, or large business. There are four major factors to a network wiring closet are network switches, storage, any software, and servers. Additional factors are rack integration and power distribution systems. Smaller businesses use wiring closets as a computing hub to house all networking, electrical power, and storage. The wiring closet can house everything needed to run the business. On the other hand, in larger businesses, the wiring closet operates in connection to a central computer hub, server room, or data center. 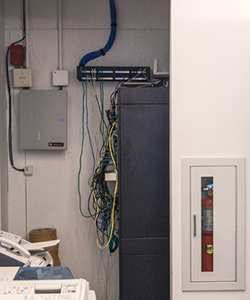 Larger businesses utilize a wiring closet as a portal to the central computing hub and data center for storage. The difference between network closets is the purpose it serves. Three purposes to consider when designing or redesigning a network closet is organization, management, and protection. Due to the lack of space in a network closet, organization is important to effective maintenance and proper operation. Appropriate rack integration systems is vital to maintain switches, servers, and storage equipment securely. Protection of the computer and equipment is a great way to dodge any risks, save time and money. I.T. closets benefit from continued and reliable uptime. Many solutions to this issue is an uninterruptible power system (UPS) to offer emergency power supply in cases of any utility failures. Other solutions are rack power distribution unit (PDU) and hot-swap maintenance bypass units allow power to be redirected to perform any maintenance and replace an UPS. Management capabilities can truly optimize an I.T. closet in addition to protecting equipment and organizing the space. The I.T. staff manages the network using appropriate hardware and software management. For the most part only Sublet Offices come "Pre-Wired" which means there are lines that run from the primary leesor's I.T. Closet all the way to your desk terminating at ports using in the form of CAT 5 or 6 wiring. In most instances each desk or seat gets 1 to 3 ports which then covers your; Computer, VOIP Phone, and perhaps a network device such as a Drive or Printer. The I.T. closet should include enough room for an interruptible power supply in the closet. A minimum of two electrical circuits contained in each I.T. closet. The design should include good lighting in the closet even both low and high. The most important is a cooling system to all electronics in the space. The space is primarily for storage, computing, and servers. It should be kept dry and access to electricity. Network equipment requires attention infrequently once installed so the I.T. closet can maintain limited accessibility. If you are searching for an office space featuring a dedicated I.T. closet – contact us and will can identify for you all the available spaces that fit your criteria. Call us today for no obligation and no fee.